Over the last month or so I have has the opportunity to develop using the Bing Maps Control for Silverlight, and thought it appropriate to share this experience as well as a bit of a 'how to' on using it. I plan for this to be a bit of a series based on the following items: - Downloading and Installing the Tools. Add a Simple map to your application. Hopefully I will cover these off over the next few weeks. So to begin, lets start with the Downloading and Installing all the required files and tools. I will assume you already have Visual Studio 2010 Full or Express, and have installed the Silverlight Tools . To install the control, head to the microsoft download page to download the Bing Maps Silverlight control installer. Run this and follow the instructions to install. This gives you the required dlls as well as as some documentation in the form of a chm file. 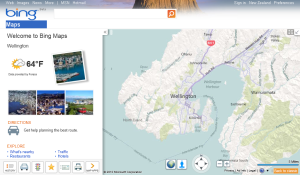 To use the Bing Maps Control, you need to provide it with a key. This key is an identifier for your application, and allows for tracking usage. Without a valid key, your control wont function. So thats everything we need to set up to get started on using the Control! For more information about the Bing Maps Silverlight Control, check out the documentation online, specifically the pages for getting a key, and information about using the key. Next I will go over using your newly downloaded control and key to add a Bing Map to your Silverlight application.